A solution is a homogeneous mixture of two or more substances. The term homogeneous means "the same throughout." For example, suppose that you make a solution of sugar in water. If you were to take a drop of the sugar solution from anywhere in the solution, it would always have the same composition. A number of specialized terms are used in talking about solutions. The solvent in a solution is the substance that does the dissolving. The solute is the substance that is dissolved. In the sugar solution described above, the water is the solvent and the sugar is the solute. Although that definition is neat, it does not always make a lot of sense. For example, one can make a solution of two gases. In fact, the air around us is a solution consisting of oxygen, nitrogen, argon, carbon dioxide, and other gases. In this case, it is difficult to say which gas "does the dissolving" and which gas (or gases) "is dissolved." An alternative method of defining solvent and solute is to say that the component of the solution present in the largest amount is the solvent while the components present in lesser amounts are solute. According to that definition, nitrogen is the solvent in atmospheric air because it is present in the largest amount. Oxygen, argon, carbon dioxide, and other gases, then, are the solutes. The term miscible is often used to describe how well two substances—generally, two liquids—mix with each other. For example, if you try to mix oil with water, you will find that the two do not mix very well at all. They are said to be immiscible—incapable of mixing. In contrast, ethyl alcohol and water are completely miscible because they mix with each other in all proportions. Concentration: The amount of a substance (solute) present in a given volume of solvent or solution. Miscibility: The extent to which some substance will mix with some other substance. Saturated: In referring to solutions, a solution that contains the maximum amount of solute for a given amount of solvent at a given temperature. Solubility: The tendency of a substance to dissolve in some other substance. Solute: The substance that is "dissolved" or that exists in the least amount in a solution. Solvent: The substance that "does the dissolving" or that exists in the largest amount in a solution. Supersaturated: In referring to solutions, a solution that contains more than the maximum amount of solvent that can normally be dissolved in a given amount of solvent at a given temperature. Unsaturated: In referring to solutions, a solution that contains less than the maximum amount of solvent that can be dissolved in a given amount of solvent at a given temperature. Solubility is a term similar to miscibility but more exact. The solubility of a substance is the amount of the substance that will dissolve in a given amount of solvent. For example, the solubility of sugar in water is approximately 90 grams of sugar per 100 grams of water. That statement means that one can dissolve up to 90 grams of sugar in 100 grams of water. 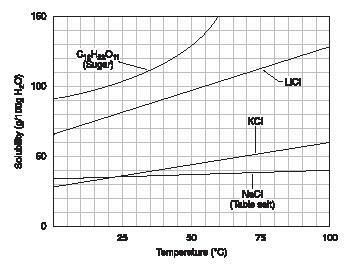 The solubility of a substance is dependent on the temperature. The statement in the previous paragraph, for example, should have been that 90 grams of sugar will dissolve in 100 grams of water at some specific temperature. That temperature happens to be 0°C. Generally speaking, the solubility of substances increases with temperature. The graph in Figure 1 illustrates this point. Notice that the solubility of sugar increases to a little over 100 grams per 100 grams of water at 25°C and to 130 grams per 100 grams of water at 50°C. An important exception to this rule concerns gases. All gases become less soluble in water as the temperature increases. Solutions are mixtures whose composition can vary widely. One can make a water solution of sodium chloride by dissolving 1 gram of sodium chloride in 100 grams of water; 5 grams in 100 grams of water; 10 grams in 100 grams of water; and so on. The amount of solute for any given amount of solvent is defined as the concentration of the solution. One way of expressing the concentration of a solution is with the terms dilute and concentrated. These terms are not very specific. For example, a solution containing 1 gram of sodium chloride in 100 grams of water and a second solution containing 2 grams of sodium chloride in 100 grams of water are both dilute. But the term is appropriate because, at room temperature, nearly 40 grams of sodium chloride can be dissolved in 100 grams of water. Thus, a solution containing 35 grams of sodium chloride in 100 grams of water could be called a concentrated solution. Solutions can also be classified as saturated, unsaturated, or supersaturated. A saturated solution is one that holds all the solute it possibly can at any given temperature. For example, the solubility of sodium chloride in water is 37 grams per 100 grams of water. If you make a solution containing 37 grams of sodium chloride in 100 grams of water, the solution is said to be saturated; it can't hold any more sodium chloride. Any solution containing less than the maximum possible amount of solute is said to be unsaturated. A solution with 5 grams of sodium chloride (or 10 grams or 20 grams or 30 grams) in 100 grams of water is unsaturated. Finally, supersaturated solutions are also possible. As bizarre as it sounds, a supersaturated solution is one that holds more solute than is possible at some given temperature. The way to make a supersaturated solution is to make a saturated solution at some higher temperature and then let the solution cool very carefully. For example, one could make a saturated solution of sugar in water at 50°C by adding 130 grams of sugar to 100 grams of water. That solution would be saturated. But then, one could allow the solution to cool down very slowly. Under those circumstances, it might happen that all of the sugar would remain in solution even at a temperature of 25°C. But at that temperature, the solubility of sugar is normally a little over 100 grams per 100 grams of water. Therefore, the cooled solution would be supersaturated. Supersaturated solutions are normally very unstable. The slightest movement in the solution, such as simply shaking it, can cause the excess solute to settle out of the solution. THis article is greatly described and it helped me a lot. HOW MANY GRAMS OF SUGAR IN 100ML OF WATER WILL MAKE SATURATION SOLUTION>? For supersaturated and unsaturated you have written more than the maximum amount of solvent. Isn't it supposed to be solute? Sugar solution A has a concentration of 0.9g/mL. Sugar solution B has a concentration of 1.0g/mL. Which of the following is true about these 2 solutions? A: Both solutions cannot dissolve any more sugar. B: Solution B is at a higher temperature than solution A. C: Solution B is sweeter than solution A. D: More sugar could be added to solution A but not to solution B. Why does the level of solution not increase when a substance dissolves in it? give me some examples of GAS TO GAS in solute and solvent. please , how can i calculate the concentration of 1microliter of 40% methylamine injected into a vessel of air of a volume of 160 ml. I want a easy method to be able to measure the concentration of different solutions of sugar. Sir, what can be solvent for a concentrated nitric acid,except water ?